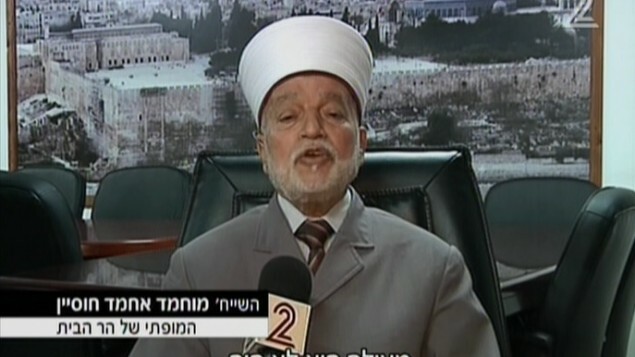 Two Muftis have been in the news lately: the wartime Grand Mufti and the current Mufti. The first, Haj Amin al-Husseini, was catapulted into the headlines over the extent of the Mufti's complicity in the Nazi Holocaust. The second, Sheikh Muhammad Ahmad Hussein, has been busy denying that the Jews ever had a Temple in Jerusalem. The two Muftis are players in a continuum of anti-Jewish religous incitement with lethal consequences. It began in the 1920s when Haj Amin first stoked Arab fears that Jews had designs on Temple Mount's Al-Aqsa mosque.The Grand Mufti remained a major force in whipping up Arab hostility against the Jews, not only in Palestine but across the Arab world. (It has recently been claimed that the Grand Mufti took responsibility for the Baghdad Farhud of 1941) . Sheikh Muhammad Ahmad Hussein's denials of Jewish history and rights to Jerusalem must bear some blame for the current wave of stabbings in Israel's streets. Aharon Nehmad, an 86-year-old Jerusalemite now living in Latin America, is a witness to this long-standing policy of poisonous incitement by the Mufti Haj Amin al-Husseini and his heirs. Nehmad 's family has been settled in the Land of Israel for over 18 generations, ever since they left Aleppo for Tiberias and later for Jerusalem. Nehmad told Point of No Return of an incident prior to World War II. The Arab revolt was then in full swing.The Temple Mount, then as now, was simmering with rumour and intrigue. Although Professor Pimienta sounds like a character from Tintin, he was a flesh-and-blood fluent Arabic speaker who was a professor of Arabic at the Hebrew University of Jerusalem and also worked for the Department of Immigration. His underground job, however, was for the Jewish secret service. Due to constant plotting and attacks against Jews, he would try and gather as much advance intelligence as possible. One of the best information sources was attending, dressed as an Arab gentleman, the speeches of murderous incitement given by the Mufti to the Muslim worshippers at the Dome of the Rock and Al-Aqsa mosque. He would report back on any plots that were being hatched to attack Jews. By 1936, declaring his opposition to the British, the Muft's incitement was at its peak. Professor Pimienta ran a greater risk of being recognised despite his perfect Arabic skills. In 1937, aged eight and also fluent in Arabic, Aharon Nehmad would accompany Professor Pimienta on his mission. Dressed as an Arab boy, Nehmad would loiter and play with other Arab children outside the mosque. Pimienta had a secret code with the boy. If his cover was blown, he would remove his handkerchief and shake it three times. The boy would then start a commotion pretending his shoes were stolen, screaming and throwing about the worshippers' shoes, and the two would make their getaway. This is indeed what happened one day in 1937. The boy was horrified to see Professor Pimienta shake his handkerchief. He started screaming and shouting, and together they ran down to safety into the Jewish quarter below. Aharon Nehmad recalls another incident. It was June 1941 - the Nazis were on the threshold of conquering Egypt. Propaganda pamphlets showered over Jerusalem announced that the city would be next. Arabs began plotting to drive out and kill the Jewish residents and divvy up their looted homes. Jewish residents found grafitti in Arabic scribbled on their walls - "this house is for Ahmed"; "this house is for Muhammed". The Arabs were staking out their loot. The Jews declared a day of fasting in anticipation of the Nazi conquest of Jerusalem, wailing and sitting on the floor. But one man was convinced that the Nazis would not come. "Don't cry," Sephardi chief rabbi Ben Zion Uziel told his flock, quoting the Biblical verse: "Not by might, nor by power, but by my Spirit, says the Lord of hosts." (Hosea 1:7). Beginnning in 1929, the Mufti's constant incitement had caused a series of riots in Hebron, Safed and at the Hadassah hospital in Jerusalem, due to long-running disputes over access to the Western Wall and fears over Jewish immigration and land sales to Jews. One historian, Avraham Sela, called the riots "unprecedented in the history of the Arab-Jewish conflict in Palestine, in duration, geographical scope and direct damage to life and property." Fearing a riot in Jerusalem, Aharon Nehmad's family, then living in Musrara, next to the old city, decided to take refuge in the Malon Ma'arav hotel, along with the rest of their Jewish neighbours. However, one Jewish woman would not budge. She was an old midwife who had delivered hundreds, if not thousands, of Jewish and Arab children. She was well known and beloved by all. She was convinced that the Arabs whom she had delivered as newborn babies - if the families were too poor, she did not charge them for her services - would not touch her. Other Arabs managed to persuade her to leave her home. They piled her belongings into a cart and took her to the hotel. It was fortuitous for Mrs Nehmad, who was then heavily pregnant and also taking refuge in the hotel. She was able to have the midwife deliver her first son. You provide such a special contribution to our history by preserving and sharing these biographical jewels.